With the ESPRIT arena, the North Rhine-Westphalian state capital of Düsseldorf is one of the ten venues with which Germany is entering the UEFA application process for the hosting of the European Championship in 2024. In total, 14 towns and stadiums submitted their documents within the framework of the national application procedure - and Düsseldorf achieved the third best rating in Germany after Berlin and Munich, and the best in North Rhine-Westphalia. 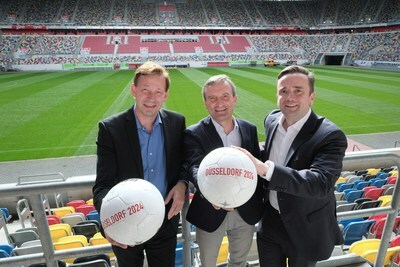 "Düsseldorf could be the venue for an international football tournament for the first time since 1988. This is a huge success for us. We are delighted that the German Football Association has selected Düsseldorf as a venue for the football Euro 2024", says Thomas Geisel, Lord Mayor of the state capital Düsseldorf. "The last few months have especially shown that the state capital organises big international sporting events with professionalism and enthusiasm. The application for the European Championships enjoys very broad support here." Burkhard Hintzsche, Chief Executive of the state capital Düsseldorf, is also delighted by the award: "Düsseldorf has submitted a very good application and is convincing. The sporting city of Düsseldorf provides the best prerequisites for the hosting of the UEFA EURO 2024: from the state-of-the-art stadium to the optimal infrastructure and the fan culture and football enthusiasm which are rich in tradition." The ESPRIT arena is multifunctional and offers flexible options for various events in a special stadium atmosphere. Thanks to the closable roof and a unique heating system, the home ground of Fortuna Düsseldorf offers visitors ultimate comfort in every season. "We have asserted ourselves against strong competition, especially in the region. This is a great success. The ESPRIT arena is a top address for the Euro 2024, as we have shown in our application. In many areas, the multifunctional arena already fulfils the requirements of the German Football Association", says Martin Ammermann, Managing Director of Düsseldorf Congress Sport & Event. "Now it's a matter of Germany also winning the bin for the EM." In September 2018, UEFA will appoint the host country. Alongside Germany, Turkey is also applying to host the tournament. Next year, it will already be possible to scent international football air in the ESPRIT arena in Düsseldorf: at the start of the World Cup year 2018, the German team will be welcoming Spain onto the grass here on 23 March.